Why not using WooCommerce built-in functionalities? 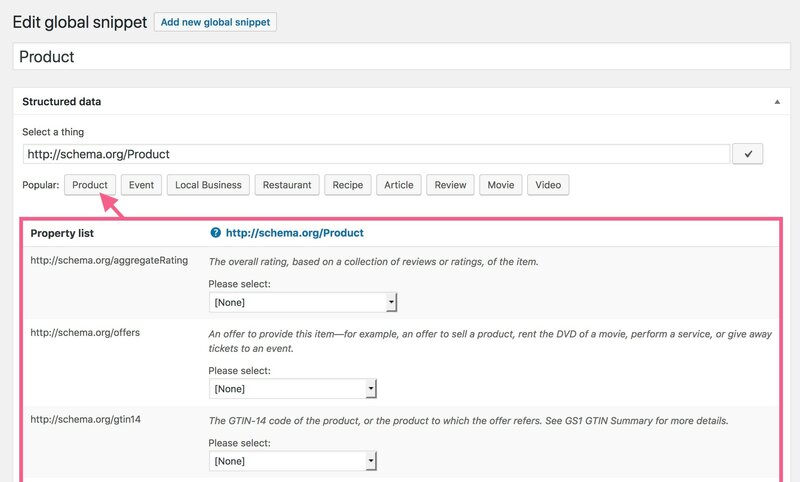 We all know that WooCommerce already makes usage of schema.org structured data for their products. However for some users it might be a little bit less information and sometimes you want to add more structured data. So the Rich Snippets WordPress is a great fit if you a) want to get rid of the structured data WooCommerce produces and b) create your own snippets for products. So what you have to do here is to just check the checkbox and save your settings. Done. Hit the “product” button to load the recommended properties for this syntax. The name should be the name of the product – of course. Normally this is the title. So just select “Current post title” from the dropdown field. In the description Google wants to see some text. Normally this should be your post content. Here you can choose “Current post content”. The brand property needs a text of the brands name (like Apple, Nike, etc.). WooCommerce does not provide such information so what you can do here is to check the “overridable” checkbox so that it allows you override this data right in your post. The review is – as the name suggests a review of the product itself. I guess that most shop owners do not review their products themselves. So it doesn’t really make much sense. I would recommend to delete this property when you do not use it. The aggregateRating is the rating a products has got from your buyers. In the WooCommerce settings you are able to activate or deactivate if users can rate your products. I highly recommend to activate this feature as the aggregateRating property is a recommended property that everyone should use. The offer property awaits one or more Offers. This would be very difficult to setup manually so I’ve built-in a nice function that does everything for you. Simple choose Offers (WooCommerce) from the dropdown and you’re good to go. What it does is to print multiple Offers with an inherited IndividualProduct snippet. WooCommerce also offers the ability to manage the Stock Keeping Unit (SKU) for each product. You can print it when Stock Keeping Unit (WooCommerce) is selected from the dropdown. Mark this property as “overridable” so that you can overwrite it in each product separately. Or add a new product property. Then use it in your snippet (possible since version 2.5.0).